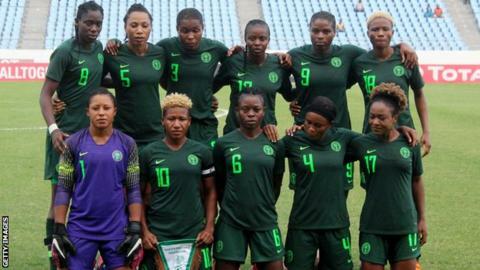 Nigeria were crowned the 2018 Women's Africa Cup of Nations champions on Saturday, beating South Africa 4-3 on penalties in the final in Accra. The match had ended 0-0 after 120 minutes, with Nigeria's goalkeeper Tochukwu Oluehi making the trophy-winning save in the shoot-out from the boot of South Africa's Linda Motlhalo. Mamemlo Makhbane's long range strike for Banyana Banyana in the 12th minute had to be palmed wide by Nigeria's keeper, as South Africa began to impose themselves on the game. Nigeria got their momentum back after 20 minutes when Asisat Oshoala just missed the target from Ngozi Okobi's corner, and an Okobi shot from just outside the 18-yard area had to be parried away minutes later by South Africa's goalkeeper Kaylin Swart. Oshoala stepped up for the spot-kick - but her poor penalty went wide of the left-hand post. Over the ninety minutes Nigeria were the more skilful side which was cancelled out by South Africa's organisation and determination. Chinaza Love Uchendu put Nigeria 4-3 up - with Motlhalo suffering the heartbreak of seeing her shot saved by Oluehi as Nigeria celebrated their triumph. Nigeria and South Africa will now prepare for next year's World Cup in France where they will be joined by Cameroon who booked their place on Friday.